While many of you had already experienced blizzards and landscapes blanketed in white, we were almost all the way through winter without any snowfall...until this week. The kids rejoiced that ‘finally’ they could enjoy sledding as we had our first snowstorm and are once again getting more snowfall today. 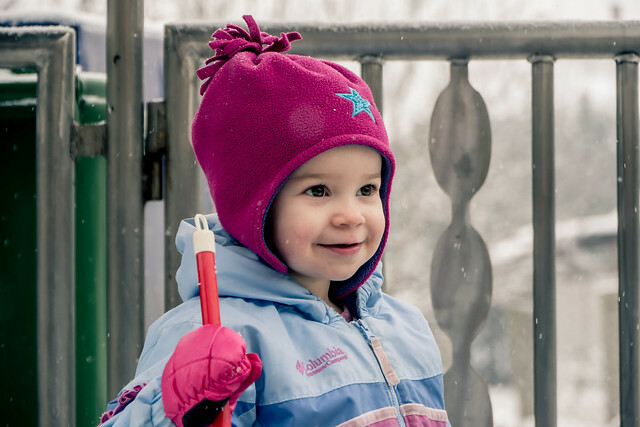 Above: Ziva enjoying her first experience in the snow. 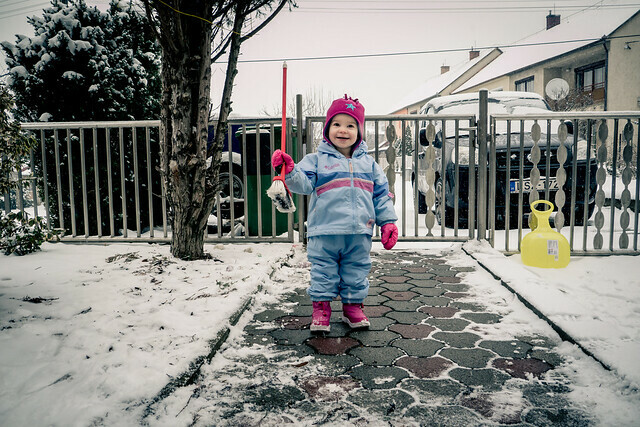 In her zeal she began sweeping snow back onto the previously cleared walkway. Oh well. Thankfully the roads aren’t so terrible as to halt all of our ministries. Just last night teammate Brenda, along with Miki’s daughter Anna joined me in traveling to Bogács for our Tuesday night Bible study. Just recently, Izabella’s boyfriend Süni (the father of her three kids) was released from prison. After Izabella was saved, she would tell Süni (at that time in prison) about what was happening in her life but he was not very responsive. Now that Süni is at home, he has restricted Izabella from attending our meetings which are in an adjacent house. I praise God that Izabella continues to study the word and I’m sure she is praying for a change of heart in Süni. The first week Süni was at home, he would peak in the window and watch us from outside as we did our study. Then towards the end of our meeting, he came into the house and stayed in the adjacent room with his kids. It was clear he was trying to see what we were all about without revealing that he was really curious. The brief comments he did make on that first night were all negative and he firmly stood against anything to do with God. He was so aggressive with his words and mannerisms that I think I shocked him when I approached him before I left. I smiled and grabbed his hand and said, “I know this is all strange. I just want to introduce myself to you. I hope we can talk some other time. May God bless you.” God has been teaching me to just love as He is love. Just represent Jesus in the brief moments we have with people. Without Christ, I would have been very nervous and afraid as this man is twice my size. But with Christ, I knew that HIs light in me was greater than any darkness I may encounter. Fast forward to this week. As is his custom, Pujka, the father of the household always greets us as we pull up saying, “God be with you.” His grandkids also run toward us embracing each of us. Katyus the mother of the household is in her normal place next to the wood burning oven and I grasp her hand and greet her. Last week Katyus had shared her struggle with depression most of her life. Tonight, she looked different. She shared later that after Brenda prayed for her last week that the next day she couldn’t stop laughing. She shared her amazement with us and Brenda encouraged her to continue praying for deliverance. Süni was also in the room. This time he was less combative as I greeted him. Although he didn’t stay for the study, he did return towards the end and sit down. This time he listened and began interacting as well. Later, Katyus whispered to us, “You see how he is changing! 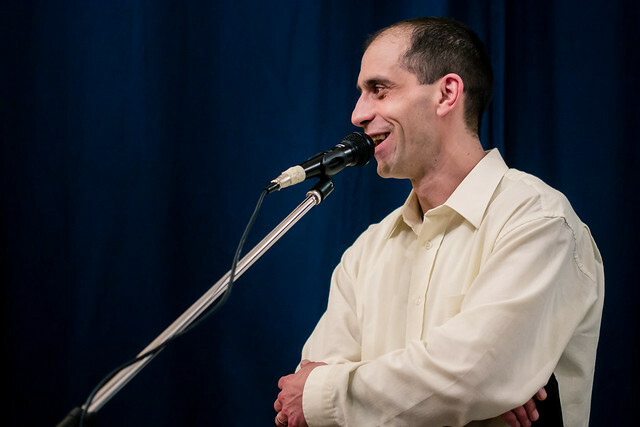 He is coming now!” It is amazing to see how God has blessed Katyus with transformation. When we first began our study at her house almost a year ago, she was skeptical and even opposed her daughter Izabella from getting too serious about her faith in Jesus. Now Katyus is asking that we all pray for Süni to have a change of heart and come to know God. Katyus also came to understand after our study from the book of Acts that when we repent and believe in Jesus, we are to be baptized into Christ and receive the gift of the Holy Spirit (Acts 2:38-39). I’ve encouraged both Pujka and Katyus to take this step and hope to be able to baptize them at their house in the near future. 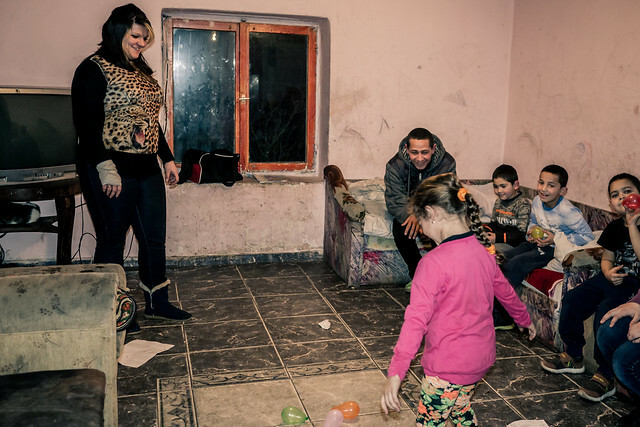 Please pray for this household and for the Gospel to spread throughout Bogács. 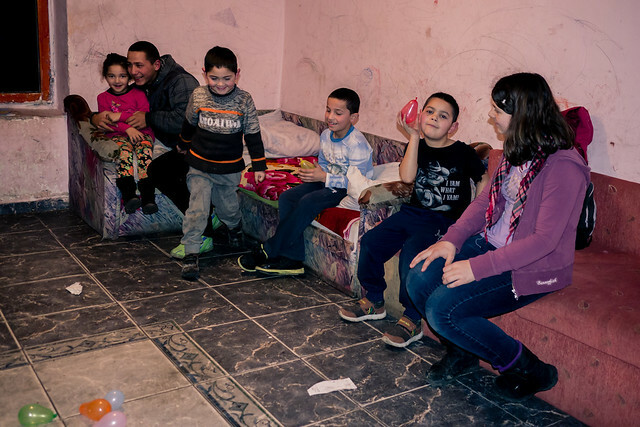 The Romani families are very connected and it will take God’s great power working in this household to truly set them free from the push of their culture away from God and following His Son. Vivi, who was previously opposed to God (even though her mother spent years praying and reaching out to her), put her trust in Jesus this past year. Tomorrow, we are planning to baptize Vivi in her home in the town of Apc. I’ve been very convicted from God’s word that baptism consistently happened at the moment of repentance. It was not restricted to those who had been tested for years. It was not associated with joining a denomination or becoming a member of a local church. People were baptized into Jesus Christ and by faith ‘put on’ Christ by being baptized (Gal 3:27). In the book of Acts, in response to the great commission of Jesus, Peter proclaims: “Repent and be baptized every one of you in the name of Jesus Christ for the forgiveness of your sins, and you will receive the gift of the Holy Spirit.” (Acts 2:38) There were thousands who believed what Peter was saying, so what did they do? The book of Acts tells us: “So those who received his word were baptized, and there were added that day about three thousand souls.” Scripture tells us they were baptized “that day.” (also please read Acts 8:12, 36; 9:18; 10:47-48; 16:15, 33; 18:8; 22:16) Peter does not tell the crowds, “The truth is, you just have to pray a prayer of faith. Baptism isn’t that important. Besides, there around 3000 of you.” No, again Scripture reveals that on the day they repented and believed, they were baptized. Why was this normal and expected by Peter, but not so normal today? Repentance, faith and baptism were part of the Gospel message. And baptism was clearly a step of faith taken at the moment of repentance and belief in the Gospel. If we were to ask Peter, Philip, Paul or any of the disciples of Jesus Christ in Acts if baptism was important or not... I think they would be dumbfounded that a question such as that would be asked. If we asked them when we should baptize someone, I think they would all say the same thing. The day a person repents and believes the Gospel. This is the example they set for us, being led by the Holy Spirit in the book of Acts. Are people tested and proven when they repent and believe the Gospel? Can I be sure that a person r-e-a-l-l-y believes if I follow the pattern that Peter, Paul and Philip set in the book of Acts? No. But I can be sure that the clear pattern in the New Testament revealed by the Holy Spirit is baptize those who repent and believe that Jesus is Lord and Savior. And this is the pattern that I seek to follow by faith. So, tomorrow (Lord willing) in a small house in the town of Apc, in a bathtub I will baptize Vivi into Jesus Christ and ask that you all pray for her to know the freedom and joy of being restored to God as a beloved child through the once for all sacrifice of Jesus Christ. Since our local school was bought last year by the Baptist Social Foundation in Hungary, there have been more opportunities for outreach not only to students but to teachers and parents as well. 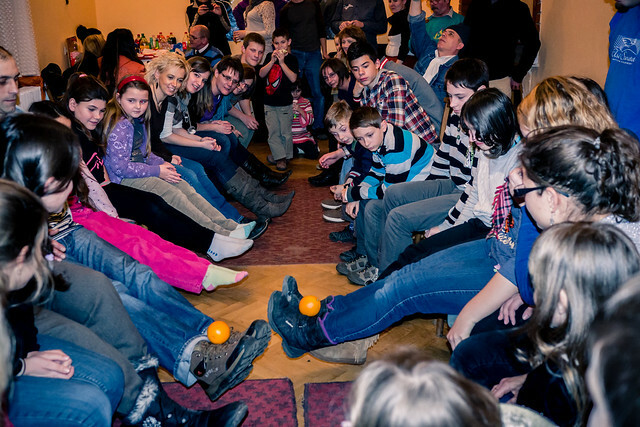 The Baptists held a special Christmas event in Budapest, inviting all the schools that are now associated with them. 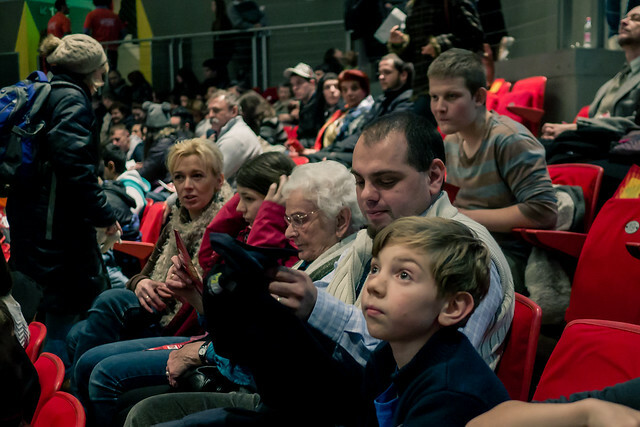 Above: Teachers, students and parents were bussed in from all over Hungary to this evangelistic event. We were thankful that teachers from our hometown also attended. 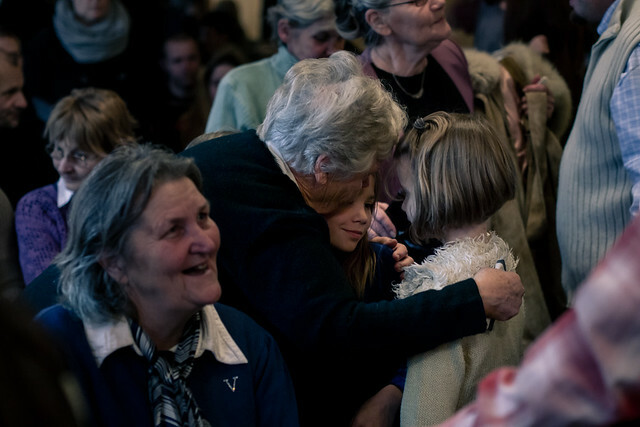 Above: Teammates, Erika and Miki invited Erika’s grandmother to the Christmas outreach. We praise God that she ended up making a decision when there was an invite to pray and put faith in Jesus Christ as Lord and Savior. Praise God for continuing to seek and save the lost, no matter how old! As is our custom on New Year’s Eve, our church comes together for an evening worship service. Afterwards, some return home and many others remain as we fellowship together until midnight. We were thankful to have many guests attend, including Beno (above left in jean jacket). Beno’s wife Timi was saved a little over a year ago and has been a part of our church’s ministry team. Unfortunately, in the midst of playing games this night, Beno slipped and remained on the floor grasping his leg. After helping him up, it was clear that his ankle had been severely injured and Beno was in severe pain. As many church members and guests looked on, we laid our hands on him and asked Jesus for healing. Beno was then taken to the emergency room where by God’s grace he was (uncharacteristically in Hungary) able to get x-rays right away. We praise God that the x-rays revealed no problems. The following day, Beno’s wife Timi reported that he was already well! Praise God for pouring out his grace on Beno. Above: “Aunt” Gizi embracing some of our kids before they head downstairs for Sunday School. Gizi is one of our oldest members who has an encouraging spirit and is constantly seeking to bless others with encouragement. Above: Tomi giving thanks to God for His work in his life in 2013. Tomi was an alcoholic with a marriage that was falling apart a few years ago. 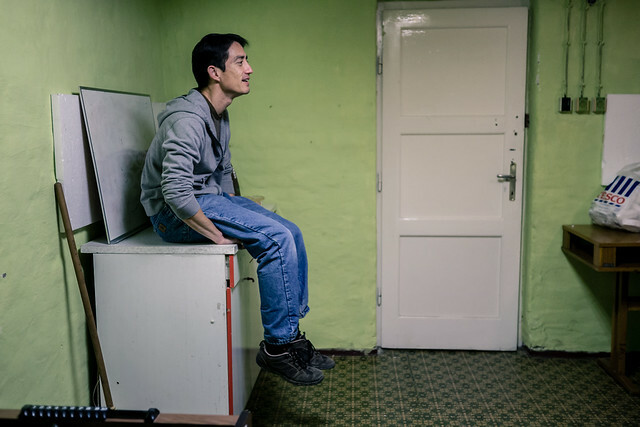 Today, with freedom from alcohol and a restored marriage, he is an evangelist. Just recently, his boss at work invited him into his home to talk more about what Tomi believed. Pray for Tomi as he shares the Gospel with those at his workplace and now with his boss Jozsi and Jozsi’s family. Above: Eszti and Zsofia, who years ago put their faith in Jesus at our VBS and have since been growing and maturing in their faith in Christ. Eszti is looking into continued education in theology as she desires to teach the Bible in public schools in Hungary. Please pray for her as this decision is hard for her parents (who are not believers) to understand. Pray that the Father would guide her to just the right school and fulfill her desires in Him. Above: Roger has faithfully been meeting with the pre-teens in our church every Sunday and investing important time with them going through Scripture. Above: Some of the pre-teens filling up one of the rooms that we are outgrowing. We have passed 100 when counting the number of people (including children) attending our Sunday worship service. I remember when the number was 4. 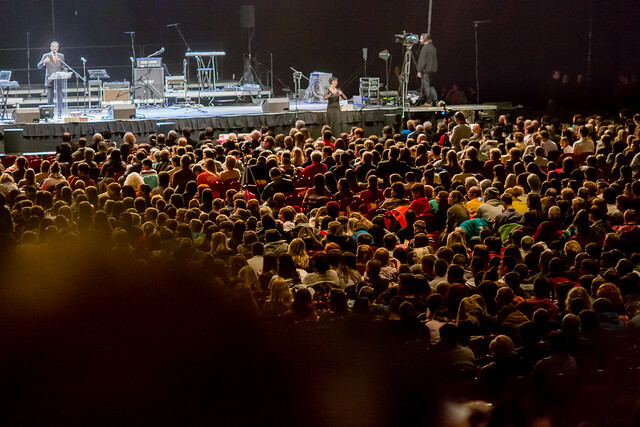 Our current meeting place is great, but with our expectation of more coming to know Jesus we just need more space. Please pray that God would provide a new meeting place for us this year. After a two week break in commuting to Bogács, I headed back out last week to start again for the new year with this household. My teammate Miki’s daughter Anna felt in her heart that she wanted to also come and help. No one asked Anna to come and she only had one experience in Bogacs when we presented our Christmas puppet ministry their. Praise God for putting his own love for the poor on Anna’s heart and moving her to join us on a school night to bring His good news and His love to this household. Above: Eniko helping with the kids in Bogacs as we hold a Bible study in the adjoining room. 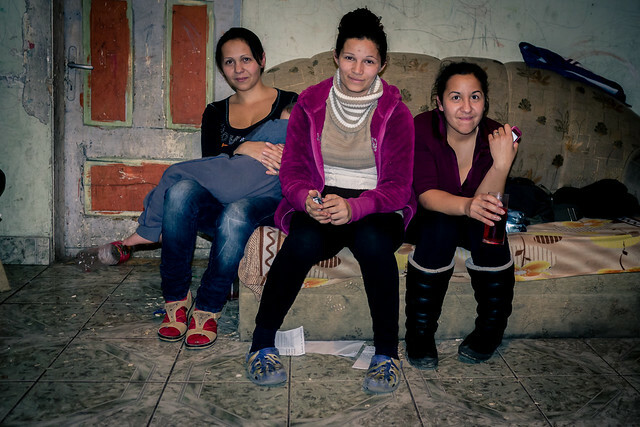 Above: Anna, teammate Miki’s daughter joining us to serve in Bogács. Above: Izabella, Mazsi and Izabella’s little sister Maci. Before New Year’s, in our last meeting, Izabella was struggling in her faith and discouraged. I was thankful that after this two week break of not seeing her to find her encouraged in the Lord. She continued to read God’s word and was freed from a valley of darkness. Also, before the break, Izabella’s mother Katyus was struggling with the call to forgive and be a peacemaker with her sister who she has been fighting with for years. I was glad to hear that over the break, she took steps to make peace as God’s Spirit moved in her to obey Jesus. Although her sister did not respond to these steps taken toward reconciliation, I praise God that Katyus is seeking to obey and has done what she can to seek for peace. Praise God for His continued work in this household! Above: Pulyka and Jozsi. 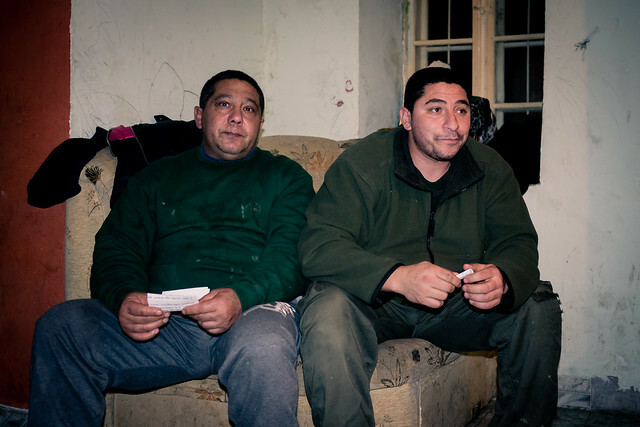 Pulyka is the father of the household, and Jozsi is married to Puljka’s wife’s sister. Over the break I had been praying for these men who had been beginning to drift and not attend as often as before. When I returned after the break, I was glad to see them and see their involvement in the Bible study. Please pray that God would put a burning desire for His word in their hearts. Pray that He would raise up leaders, pastors, evangelists from this household and bring His kingdom into this village. 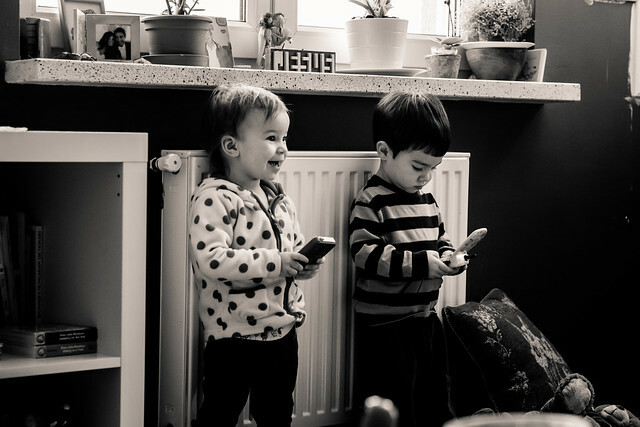 Above: Ziva with her friend Sam. 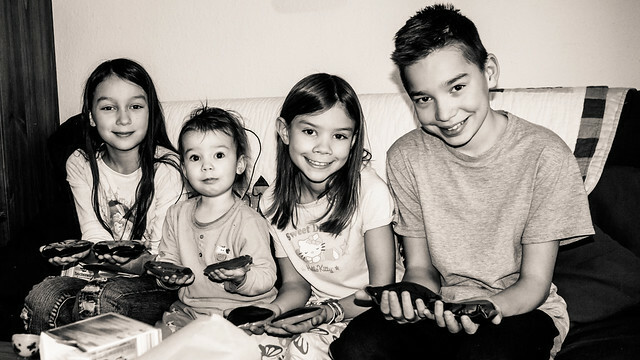 Above: The kids on Christmas morning, Ellie, Ziva, Kira and Ben. We’re looking forward to a New Year and seeing how God will continue to pour out His abundant mercy and grace. Thank all of you that have supported us in this ministry and pray for us. You are partners with us as we seek to plant more churches in Hungary for the glory of Jesus Christ.